Taxes are part of how economies around the world operate and the Platform is no different - except the Platform operates all the process Online on a global scale using a more broader and ubiquitous system that benefits everyone in all locations. LAT is a Goodwill Tax ( Global Wealth Tax ), it's a small 2.5% fee that's collected and distributed back to help the Locations grow and benefit all the Users that are managing their UDI Portfolios. - GCP is instrumental in spreading productivity out into isolated locations. In the background of the Global Productivity Grid is a global location activity tracking system that evaluates in real-time what LAT is collected from the various activities in each location, then using a process it adds the particular value to the Location Symbol involved, this extra value is then shared equally across every User holding various quantities of the Symbols. With a high entry point for many people to be involved with the sometimes volatile share markets, being based on speculation, the LAT is a real-time recognition of genuine productivity that is equally shared amongst Users who are able to follow trends in the global productivity on the Platform. - with the activity that each User builds with their own uniquely collected LAT value, it forms a type of global standing ( report or reputation ) that follows the User into future activity on the Platform. - see how The Placebo Effect keeps track of Seller's Selling Prices paid out from Cloudfunds. - basically exploiting another country's sweat labour at each level of taxing all the way to the end customer. - it's this share of the productivity that separates the standard way values and taxes move around the world by distributing the collected LAT and directly adding it to each location where each participant is located, this means that the more participants there are from one location the more value will be gained in that location as the distribution is applied - in real-time. - each User has a UDI Portfolio that can be expanded by buying Location Symbols and get a share of the continual activity gaining the LAT values. UDI Portfolio is like an account that will continually gain value in real-time, each portfolio is unique to each User who can buy and sell Symbols to find the best Trends in activity around the world. A User can add or withdraw from their UDI Portfolio and use the value however they want - transfer, spend, withdraw. 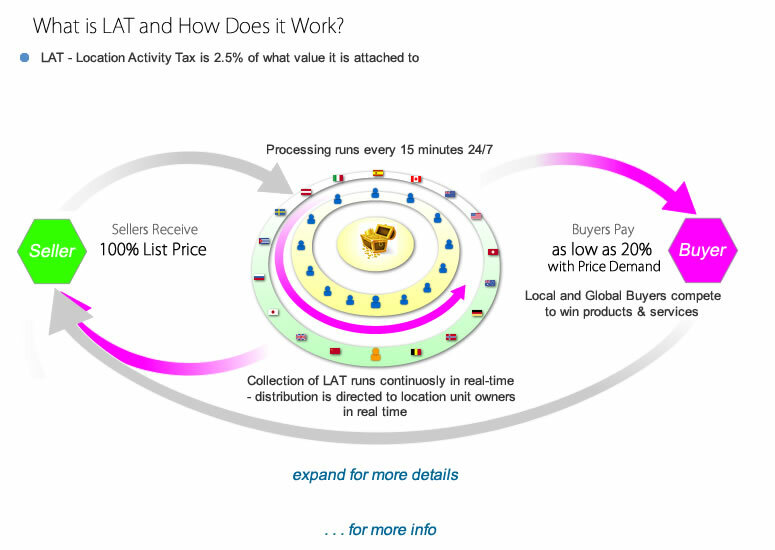 Other benefits that come from applying LAT on the Platform is it helps to eliminate payment transfer and exchange rate fees normally added to commerce. How small is the 2.5% LAT? For a Deal worth $100.00, Bidders can expect to pay just $0.12 LAT if they reach the Final Call - but then get the benefit of growth added to their portfolios when the Deal is 'sold' and the LAT is distributed back to the various Location Symbols - plus all the LAT gained from all the other Deals sold around the world - in real time.